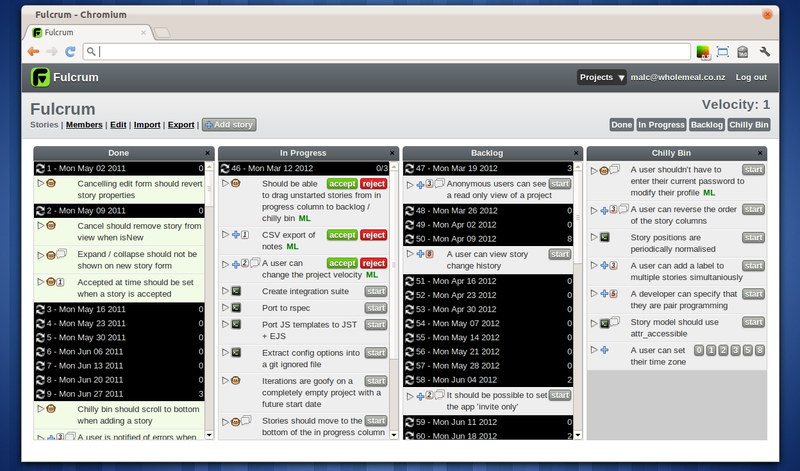 Fulcrum is an application to provide a user story based backlog management system for agile development teams. See the project page for more details. Fulcrum is still in early development, so now is the time to make your mark on the project. Fulcrum Users - A general discussion group for users of Fulcrum. Fulcrum Developers - Discussion on the development of Fulcrum. You might also find someone in #fulcrum on the Freenode IRC network if you're looking for realtime help. See the Development section below for details on contributing to the project. Fulcrum is a clone of Pivotal Tracker. It will almost certainly never surpass the functionality, usability and sheer awesomeness of Pivotal Tracker, but aims to provide a usable alternative for users who require a Free and Open Source solution. Fulcrum is still a work in progress, but if you're really keen to try it out these instructions will hopefully help you get up and running. You should then be able to navigate to http://localhost:3000/ in a web browser. You can log in with the test username test@example.com, password testpass. If you wish to host a publicly available copy of Fulcrum, the easiest option is to host it on Heroku. # Create your app. Replace APPNAME with whatever you want to name it. Once that's done, you will be able to view your site at http://APPNAME.herokuapp.com. Check the issue queue for a list of the major features which are yet to be implemented. These have the feature and unstarted labels. If a feature you'd like to work on isn't there, add an issue. Leave a description of how you are going to implement the feature. Failure to do this may lead to you implementing the feature in a way that might conflict with future plans for Fulcrum, and so increase the chances of your work being rejected or needing a rework. If you'd like to discuss anything about the issue in greater detail with other developers, do so on the Fulcrum Developers mailing list. Make your changes on a branch, and use that branch as the base for pull requests. Try to break changes up into the smallest logical blocks possible. We'd prefer to receive many small commits to one large one in a pull request. Feel free to open unfinished pull requests if you'd like to discuss work in progress, or would like other developers to test it. Run rake spec to check the Rails test suite is green. You will need Firefox with Selenium installed to run the integration tests. For any UI changes, please try to follow the Tango theme guidelines. The easiest way to test the impact of CSS or view changes is using the 'testcard' at http://localhost:3000/testcard. This is a fake project which exposes as many of the view states as possible on one page. Fulcrum is made available under the Affero GPL license version 3, see LICENSE.txt.